The Clone-o-Matic is the most modern clone-mirror-backup-restore tool in SL today. It has been designed to give content creators a quick and easy way to clone an object in their name. It also supports producing a clone that is mirrored around X, Y or Z axis, backup an object to an external text file (or a notecard in SL), and restore an object from a text file. Why would you need to recreate an object manually any more (it is tedious and error-prone) when you can do it automatically with the Clone-o-Matic? ● You built an object with one avatar and you wanted to change the creator to another (e.g., an alt.). ● You bought a full-permission object that you want copied in your name. ● You want a symmetrically mirrored copy of an object without manually creating it (e.g., left and right shoe). ● You got burnt before losing objects in SL and want the convenience of backing them out of SL and restoring them when needed. ● Optional one time setup that takes under a minute if you want clones to show you as a creator. ● Very fast cloning operation and very easy to use menu-based user-interface. ● Creates exact or symmetrically mirrored clones of objects around X, Y or Z axis. ● Offers to automatically link your clone’s prims, while preserving original link order. ● Allows you to turn on/off copying the names/descriptions of cloned prims. 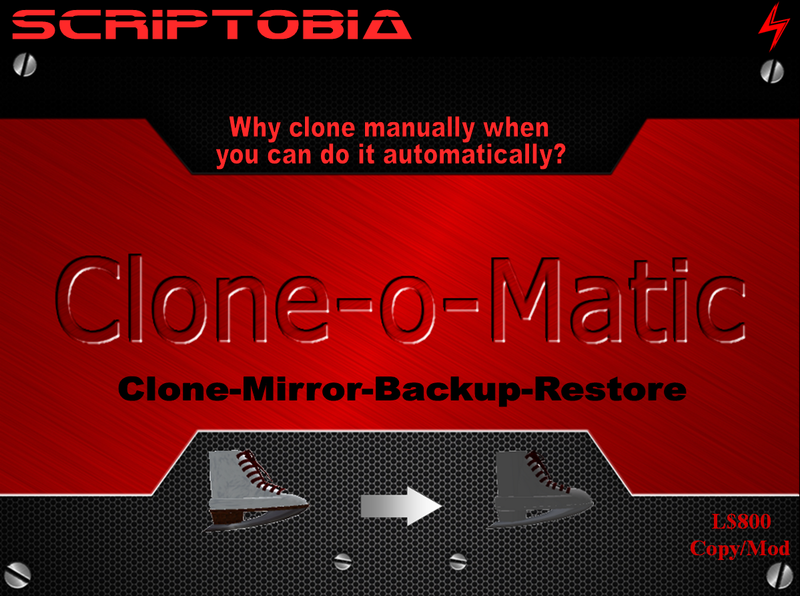 ● Allows you to set the position where the clone will rez relative to the original (or to the cloner in case of restore). ● All possible prim parameters (including flexi and slice) are copied so you have an exact clone! ● Unique low prim mesh design to allow you to rez many cloners to clone many objects at the same time. ● Scripted natively for MONO and optimized for high speed and low lag. ● Step by step instructions on performing the various functions. ● Free examples objects to restore from the Clone-o-Matic. ● Free life-time updates and professional support by creator. ● Objects need to be full permissions for textures (inc. sculptie maps) to be copied (SL limitation). ● Mesh can not be copied yet (SL limitation). ● Prims need to be between 0.01 meters and 64 meters apart on any dimension to be copied (SL limitation). ● Animated textures / particles and not copied (SL limitation). ● Floating text and the prim contents are not copied (may be supported in upcoming revision). Scriptobia does not condone copying other people’s work without permission or any behavior in violation of the SL TOS. Use this tool responsibly and at your own risk! Contact Maged Wise by IM for any question or to ask for support.